The Dungeonheart - too similar? You already saw the new DungeonHeart maybe in the new Videos or new Demo. It is created by a Friend of me (also from Hamburg) some Time ago. The Model is nice, just the Question is: Is it to similar to the original Dungeonheart from DungeonKeeper2? If not, we also want to Post it on OGA and use it in the Game (of Course). Re: The Dungeonheart - too similar? Hm that could cause some Licencing trouble or? The dimensions are different but besides that, I have to agree, I dont realize its that similar. Well I guess no-one replied because it was obvious (even though unlikely that anyone would ever sue about that). A different version taking updated gameplay in mind (stealing energy crystals Defense Grid like for example) would be nice to have at some point though. In fact you don't need to create a new one entirely, just transform it a little bit, maybie reduce the pilars, put a roof, and put the energy center stronger and in a bigger altitud, i don't know, is just one idea. Just transform it, it's not that close to the Heart of DK2 than to need make it a new one from 0, but if you remove/put more stuff and alter significatebly the shape, it can work. ¡Keep it up the good work! PS: I'm sure than, like me, exist another ones who come, check your proyect and wait for an alfa but don't say anything about it, that's why, ¡Keep it up the Good Work, All of u! How about an actual heart, maybe in a cage ? Wasn't there an actual heart inside the structure in DK 2? currently i have some fun to play around and try some ideas of a new dungeon heart, cause the current is a little to near to the origin dungeon heart. Heh, that could make for some interesting game-play too, like sacrificing minions or heros by dropping them into that mouth for various bonuses. Could be even a "crafting" mechanic by combining different sacrifices to get extra special effects (like sacrifice a dragon and a virgin to get an extra pile of gold or so). its not bad, i like the idea, but those two circles make it look ugly. Just and idea, change them for two hexagons (or octogons), and use a darker texture so you can put glowing runes along the hexes edges and spikes, also animating the teeths would look quite cool (i also think there are too many of them, put less and bigger for better vision). Thanks for your ideas, i tested some darker textures, but for now i have some blender => orge => jmonkey problems to solve. If i solve the problems, i will test some improved concept arts from my girlfriend. To say somethink positiv at the end, now i know how to export to svg and work with vector based image, which is really nice for me. The second version is really an improvement. 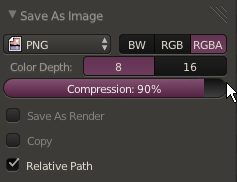 For your alpha problem: Here http://i.imgur.com/LgO3hqW.png (RGB vs RGBA), this is after uv/image editor -> image menu -> save as, you can make sure no alpha information is inside. So i use the blender file (still bad at all, but works). How dark and cruel do you want the game to appear? 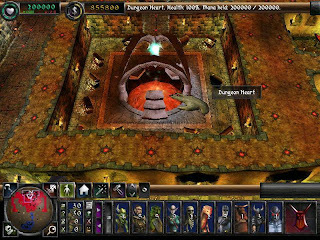 The dungeon heart structure in DK 1 was made like a jewel, it had a much more positive and light attitude to the open beating heart with the teeth that is shown in this thread. I've not played DK 2, so my experience is a bit limited when I say that I liked the appearance from DK 1.
hm.....ok, thats almost the definition of "similar"
2) Are you trying to say all the other models and textures aren't similar to the ones in DK? At first I thought the blackish gave it too much of a fancy modern look. Though looking at the screenshot it integrates just nicely. I can't say I agree entirly with your interpretation of the KISS methodology here. Keep in mind that the Dungeon Heart is the most important building in your entire dungeon and has to represent the presence of the evil keeper within the realm. Ofcourse, I do agree with KISS in the way of, "don't overdo it". The organic teeth/spikes growing out of concrete walls just don't look right. And how are they supposed to chew on things? Making them growing out of the heart would make them more usable at defending against attack. Is there a way for the heart to restore it's health or it is just a tower defense game, where last to lose all health wins the game? Maybe sacrificing prisoners to the heart would restore it's health? If I rememebr correctly, in Dungeon Keeper 1, the dungeon heart just healed over time, i.e. it grew back to the original strength.